The present italian coat of arms is never shown either on the merchant or on naval ensign. The shield you see there is the italian naval shield (with crown - navy, without crown- merchant ships). The prsent coat of arms of the Italian republic is the one described in this page. The one on the naval flags is made up by joining the 4 shields of the ancient "repubbliche marinare": Pisa (whitem "Pisan" cross on red field), Amalfi (white "Amalfi" cross on blue field), Genoa (red cross on a white field) and Venice (St.marks lion with a sword for the navy and a book for the merchant ships, gold on a blue field). - Minister of Aeronautics flag - probably not in use today as there is no more such a position. - Minister of Marine (Admirality) - probably not in use today as there is no more such a position. It's the EU "civil ensign"; it is customary, I'm told, for Europeans to display the EU flag on private boats with their own ensign in the canton, here Italy. 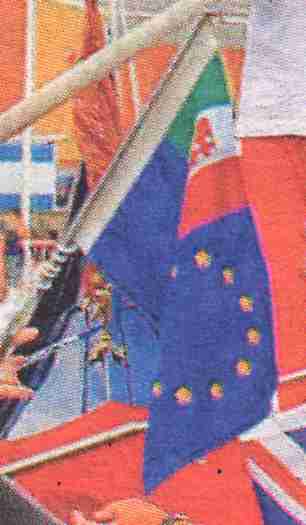 That's an Italian European Ensign, as used unofficially on internal European waterways. There are variants for most other EU countries, such as Britain, Belgium, Netherlands, Germany and France. Now this is strange, in the first place: Why ships operating in internal European waterways don't use their own national ensigns and/or courtesy flags, even if only officially? In August, our local newspaper had a report on its 'national news' page about a Venetian who had taken a gondola across the English Channel. 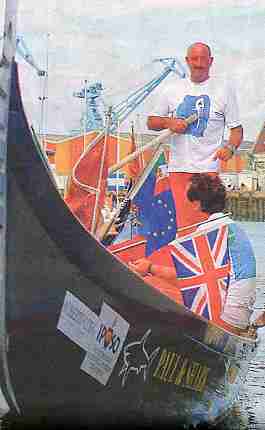 The article was accompanied by a photograph which showed the gondola flying three flags. One was the banner of St Mark for Venice; one was the Union Jack, flown considerately but incorrectly as a courtesy flag; and one was the Italian version of the European Civil Ensign. The one shown above, has the national flag in the canton smaller than the one shown on the gondola. My observations in the past of European Civil Ensigns have been more like that on the gondola, with the twelve stars clearly in the fly rather than central. Anything is valid, as such ensigns/flags are absolutely unofficial. They are like any "fun flag". It´s up to the flagmaker and the user to find a design they like. The usage of this flags is so unofficial and anarchical, that any "standard" is tough to define. The boat actually flyes no ensign. He is not showing any flag to indicate nationality, and could be fined. Not to mention legal problems in case of accident. European Civil Ensigns are fun flags. This flag was reopted as 2:3 at Adria Bandiera catalogue and in a much longer ratio, about 4:7 in a. photo of a real flag. Above are both versions. The page <governolo.interfree.it> (in Italian) shows  among other navigation signals  two flags used on the River Po: "Two signals [are used in the] riverbed, represented by surface buoy (where the bottom is high) or red or white flags: the red flags or the red surface buoys are put at about 20 m. right from the course for those who sail downstream; the white flags or the white surface buoys are put at about 20 m. left from the route for those who sail downstream; vice versa for those who sail upstream.". There is also a sketch in the end of page. Another table showing the flags are at the end of <www.deltadelpo.it>. Present-day signals on the River Po also at <www.arni.it>: red flags or panels (ill.) pp. 14 and 16 of the file No white flag around if I am not mistaken.